I don’t like having to pay for extra space, anywhere! And I do like to use lots of images, especially in blog posts and tutorials. How about you? 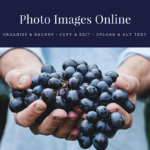 Do you know how to handle photo images for publishing online? On web site and blog posts?